The enormous restaurant occupies three floors of a downtown building. Biscuits preceded a trip to the buffet. The fried chicken had been on the buffet table too long. 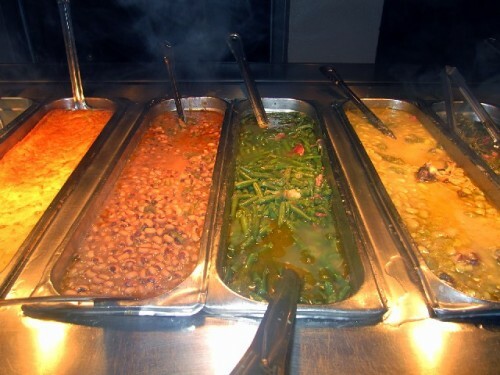 An array of side dishes. 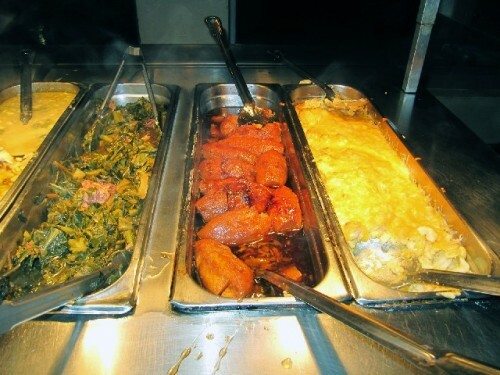 Collards, sweets and mac n cheese. The signature crossed crust of the pot pie. 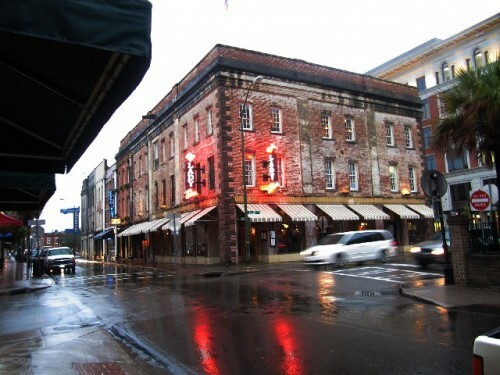 It was a rainy day in Georgia when we visited the shrine of now embattled media queen Paula Deen and her three floor restaurant The Lady and Sons. 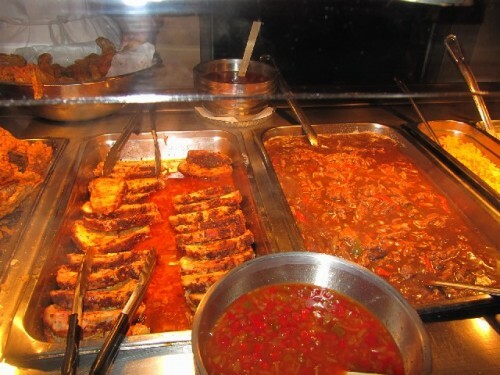 During a three week drive through the South, and several days in Savannah, we had experienced a number of buffets and sampled superb regional cuisine. Largely based on her celebrity we decided to check out Deen’s widely touted restaurant. Locals we spoke with told us not to expect much. That it was crowded, noisy and served average food. That said we went anyway just to have bragging rights. When in Paris you check out the Eiffel Tower, or Big Ben in London. Right? 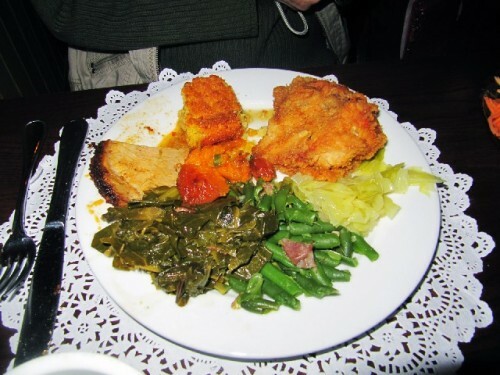 In Savannah you dine at The Lady and Sons and have lunch, they only serve lunch family style, at Mrs. Wilkes’ Boarding House. Interestingly enough Mrs. Wilkes’ lunch with a table cluttered with about twenty items and Deen’s dinner buffet both were priced at $17.95. Beyond the similarity of price, however, there was a day and night difference with the charming, down home hospitality of Mrs. Wilkes’ and the tourist trap ambiance of The Lady and Sons. 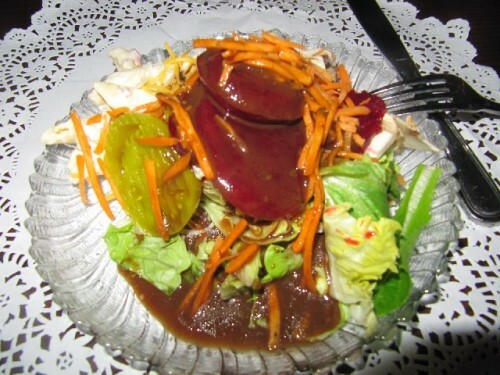 The Deen restaurant and its spin offs, like Uncle Bubba’s outside Savannah on the road to Tybee Island, as well as all the product endorsements comprise an empire based on marketing her as an icon of Southern charm, cooking and hospitality. 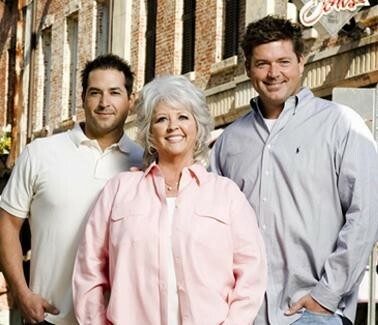 Paula Deen is to Southern cuisine what Dolly Parton is to country music. These are big hair ladies with mega-watt, ready for prime time smiles. Until Deen opened her mouth one too many times. The widely read deposition and media coverage has been devastating. She appears to be shut down as a TV celebrity and sponsors are dropping her like a hot johnnycake. 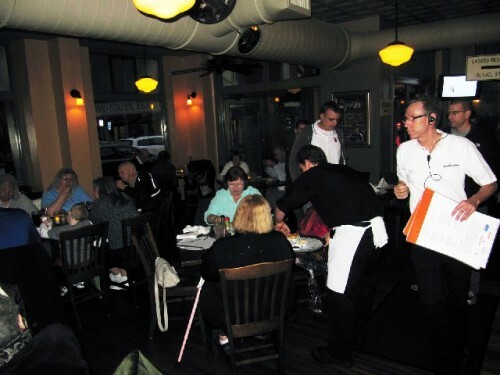 The restaurant was packed on the night last February when we arrived without reservations or inhibitions. After a brief wait we were sent up to the third floor. 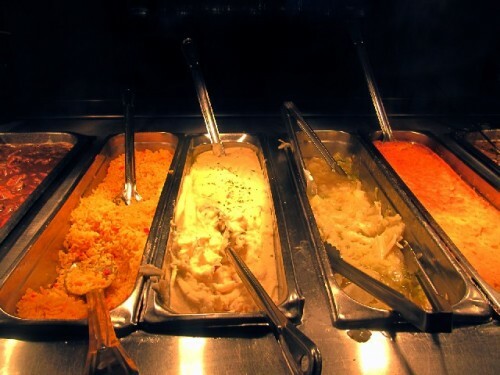 They each seem to be the same with duplicate buffets. The African American wait staff was terrific. Our waiter was super friendly and helpful strongly recommending his favorite items on the menu. 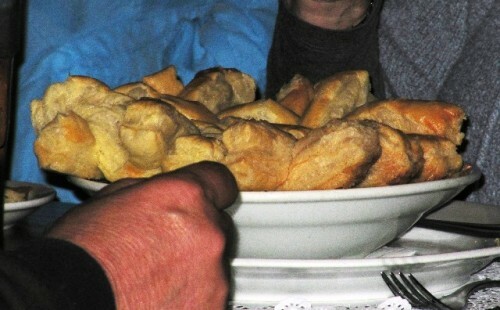 That included the chicken pot pie with its signature, huge, puff pastry lattice top. Wanting to sample the range of food we opted for the salad bar, not particularly interesting, and buffet. 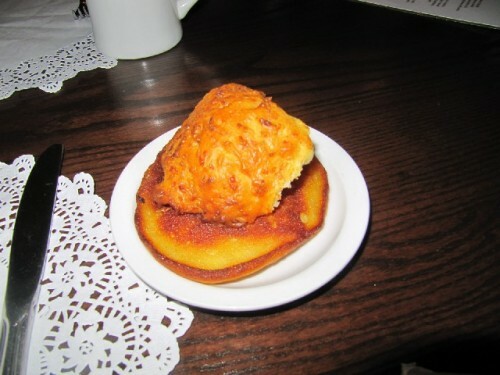 Hot biscuits were served before we headed to the buffet. Compared to Mrs. Wilkes’ where it came fresh and crispy from the kitchen by the time we got to the buffet the rather generic fried chicken had been sitting too long. This mattered less for the sliced pork loin which was marinating in a sauce. 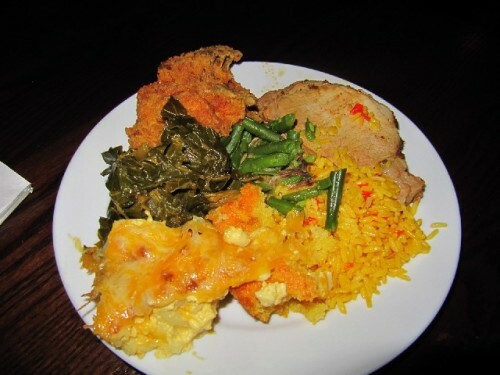 There was a wide selection of sides; collard greens, string beans, mashed potato, candied sweet potato, cabbage, black eyed peas, lima beans, mac and cheese. 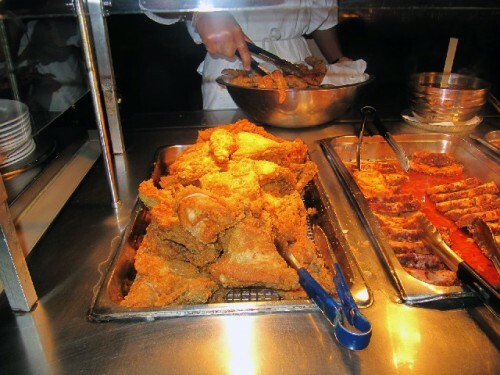 In short nothing that we hadn’t had at every other Southern buffet we visited. There was nothing that we tried that had a signature or style unique to Deen. For that, of course, we might have tried ordering off the menu. There were indeed many enticing items. 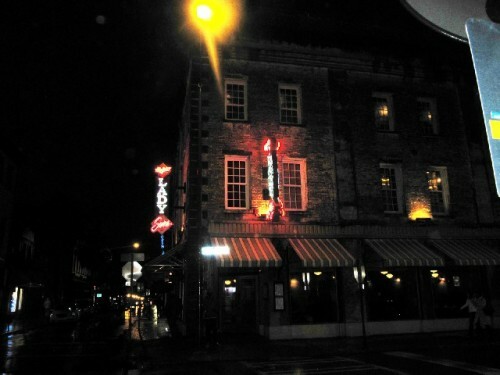 Considering ambiance (so so), service (superb), and food (fair to middling) overall we give The Lady and Sons a C+. Ok, in this era of grade inflation, B-. Having checked it out there is no need to go back. 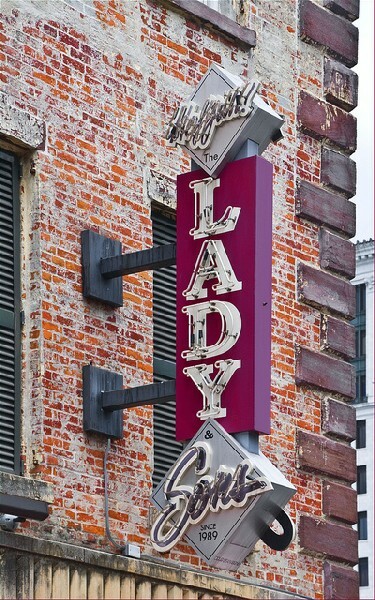 For tourists there are other and better dining options in Savannah. Like the traditional Pirate’s House where Mom and I dined decades ago. This time Astrid and I enjoyed a fine and cozy meal. It’s still awesome. "Several years ago, on a trip to Savannah to lecture at Savannah College of Art, we ate a delightful lunch at Mrs. Wilkesâ€™ Boarding House. We were not enticed to Dean's place, so we did not experience it. However, Paula Dean's demise is sad on so many levels. Will she become just a memory of things overcooked and rather tasteless? "